This is a vitally important book for social scientists and all concerned with being open to new ways of addressing complex issues within our communities. It examines our capacity, as individuals and together, to bring about transformational change – not any change, mind you, but the kind that is required to deal with truly ‘wicked’ problems – the kind that, by definition, have no solution. In modelling transformational change, authors Valerie A. Brown and John A. Harris suggest that we need to be encouraged to see how small changes can lead to large, unpredictable effects across a whole system (including human and natural systems). They also propose that we need to recognize that, through transformational change, the future is not going to be the same as the past. This seems to me to be a critical realization, because we might desire our brand of change to be controlled, supportive (of our actions), and predictable, and we should acknowledge that notion is absurd. On reading this book, one sense I have is that envisioning the scope of some transformational change may require a long lens. In social terms, for example, we could consider how transformational change has wrought the role and contribution of people with a disability now compared with their invisibility in society only a few years ago. But, what is transformational change and why a collective mind? Chapter 13 of the book provides a useful summary of the context in which to consider these concepts. Brown and Harris propose that transformational change occurs all around us, not only in relation to urgent issues or concerns, but also in relation to the matters that we shape and are shaping us every day by our everyday interventions and responses (or lack of them). The rate of transformational change, they argue, renders projections or predictions about the future likely to be ‘extremely unreliable’. We can observe this in some fields of social science – social planning for example – where the rate of change within communities and across cities challenges the skill of practitioners seeking to maintain a focus on responding appropriately to immediate social needs. Add to this that old ways of solving problems have not served us well. We tend to be locked into ‘silos’ of knowledge or specialization that limit not only our perspectives but also our creativity. In the social planning example, the values (of justice, fairness and inclusion) and views of these practitioners are often trumped by economic or political imperatives. By contrast to siloed activity, the collective mind embraces not only the fields of knowledge we need to access externally for effective decision-making but also our own knowledge bases at a personal/introspective level. The authors propose that searching for ‘positive and practical ideas on moving towards an unknown future’… ’means accepting the reality of the dynamic connections between parts and wholes, stable and chaotic systems, individuals and groups, and creative and rational thinking. Reflective: Building in a stage of review that respects the paradoxes influencing our interpretation of reality (interconnections of parts and wholes; stable and chaotic living systems; individual and collective learning; and different paths of human thought). For social scientists, whose work can sometimes struggle for legitimacy alongside ‘straightforward’ physical or economic measures, these are a gift, because all seven types of evidence are considered essential for developing policy and decision-making. The book eloquently explores questions around these types of evidence, and interweaved through the discussion are examples in science, art, literature, and philosophy that focus upon ways of escaping from the opposites to relationship-building; bringing together parts and the whole; embracing complexity; understanding different traditions; expanding empiricism; accepting (and working with, rather than against) dynamism. The book provides detailed and fascinating life story examples of great thinkers who employed both introspective and broader thought processes to be described as collective thinkers. Chapter 2, on Charles Darwin, is a personal favorite. It describes the confluence of his introspective, physical, social, ethical, aesthetic, and sympathetic thought over a lifetime of diverse (in some ways, unprecedented) experience and environments and in the company of loving family and devoted colleagues and collaborators. The book also includes chapters devoted to fellow ‘sorcerers’ James Lovelock (Gaian theory) and Norbert Wiener (cybernetics) and visionaries who interpreted and extended their thinking. As social scientists, we already practice some of the elements of collective thinking (for example inclusion, collaboration, trust-building, etc.). This book invites us to further those skills, to bring together our mutual learnings, to change the ways we acquire knowledge and make decisions (including by bringing other collective thinkers to the process). In this endeavor, we could also learn from a ‘companion’ volume to this book published in 2013, which includes a wealth of tools to assist practitioners in collective learning and collaborative action. It is Collective Learning for Transformational Change: A Guide to Collaborative Action, by Valerie A. Brown and Judith A. Lambert. The Human Capacity for Transformational Change is a book that encourages an essentially positive view of our futures, collective and individual. It is important for those seeking to explore ideas for better ways of approaching transformational change in their lives, practice or communities. The book invites the opportunity to dip into key chapters at will. I would encourage readers to first read Chapter 13 for excitement about the possibilities and then return to Chapter 2 for a beautifully researched and articulated insight into the Darwinian (and others) mind. 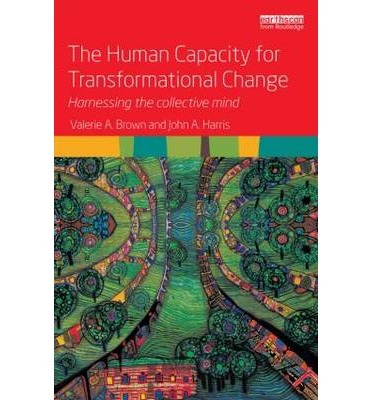 Brown, Valerie A and John A Harris, The Human Capacity for Transformational Change: Harnessing the collective mind, Routledge, 2014, p 199. As an example, in the Griffith Review’s Culture Wars or Cultural Solutions’ (June 2014), Australian artist and festival director Robyn Archer commented that the measurement of performance needed to become more sophisticated than merely recording the number of seats occupied, but also to ask ‘was the audience delighted’? Wouldn’t it be marvellous if the same principle was applied to, say, planning for a new housing subdivision? Brown, Valerie A and John A Harris, The Human Capacity for Transformational Change: Harnessing the collective mind, Routledge, 2014, p 111.